This dartboard is re-selected each year by the PDC exclusively for the official PDC Dart World Championship. 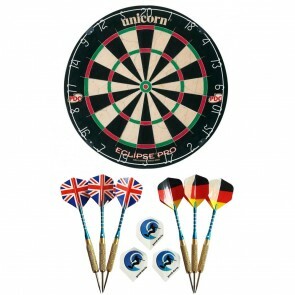 The PDC dartboard from the Unicorn brand alongside the professional dart players the star, which is most commonly seen in the TV shows. Intensive use at official tournaments gives the developers of the PDC Dartboard such important feedback that the Dartboard can be improved and developed every year in terms of materials and workmanship. 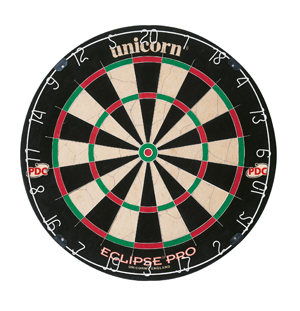 The official name of the PDC dartboard is "Unicorn Eclipse Pro". 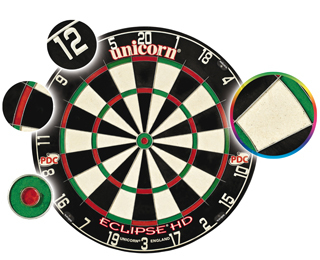 What makes the PDC dartboard so special? There are many good reasons why the PDC has just selected this dartboard for the official tournaments. The professional dart players not only value flawless processing, but also many small additional details that can improve the hit rate . 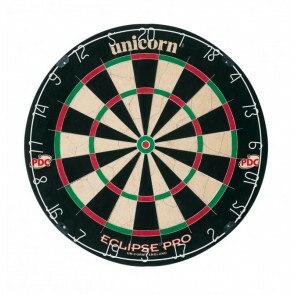 The Unicorn Eclipse Pro PDC Dartboard is made from the natural material sisal. The sisal is pressed during the production process so that the necessary strength is achieved and the darts remain reliably buried in the board after the impact with the wonderfully pleasant sound (KLONK). The excellent fabric properties of the PDC dartboard unlike other dartboards are praised by professionals and amateurs. During production, the sisal bound around the midpoint is fixed with a stable bench. During compression, the sisal is fixed against a wooden back wall. Working with sand creates the typical structure of the front for Bristle Boards. When the dart is pulled out of the disc, the sisal returns to its original shape due to its natural properties and immediately passes the small hole in the disc. Due to the high-quality natural product sisal, the PDC dartboard has a long service life. 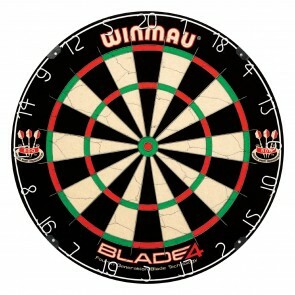 To extend the life of the dartboard even further, you can turn the disc regularly, and so on to equally use the errors. Every millimeter counts. Especially with the PDC pros every small advantage for a better hit rate is extremely important. 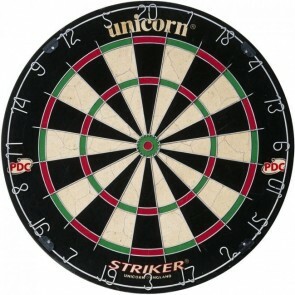 Unicorn has done one thing above all else in the development and implementation of the wire: An even thinner wire for separating the individual segments has enabled the target area to be increased by 30%, in contrast to many other dartboards. Furthermore, the wire on the PDC dartboard is embedded between the segments, resulting in fewer rebounds should the dart hit the wire. 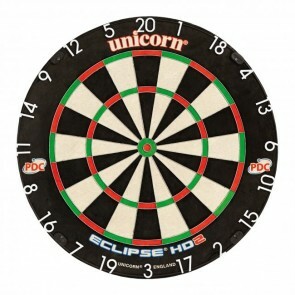 The Unicorn Eclipse Pro attaches to the middle of the bullseye with the included wall mount bracket. The screws can be easily turned into the board with a conventional Phillips or Phillips screwdriver. 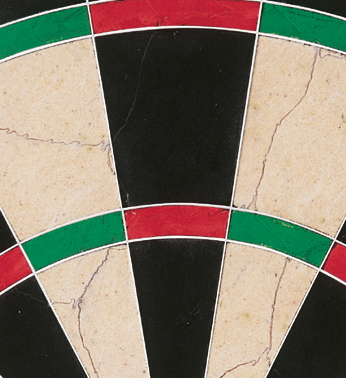 Make sure the correct distance and the height of the dartboard are in place during installation. Here is a detailed guide on how to assemble your PDC dartboard in the right way Distance and the right height. The weight of the PDC dartboard is 5 KG. We therefore recommend that you select a stable wall or door for the mounting of the disc to prevent it from falling down. If you want to attach the dartboard even more sturdily, you can choose thicker screws and larger dowels instead of the supplied screws for wall mounting. The new PDC Dartboard may have odor. This slight smell should have disappeared in only a few days. This dartboard mainly uses natural materials and does not release harmful substances. The official PDC dartboard is just fun from the first throw. To ensure a long life of the dartboard, you should pay attention to the following things. Protection against moisture - Put the dartboard in the face of prolonged moisture. Permanent attachment in the exterior area is not recommended. Regular Dartboard Turn - Distribute the wear on the high traffic segments equally by rotating the dartboard regularly. The number rings can be adjusted correspondingly simple, so that the 20 is also up after the turn. Other Unicorn PDC Dartboards and Bristle Dartboards.